Definition at line 93 of file utility_classes.h. Constructor that fills all values with default attributes. Definition at line 128 of file utility_classes.cpp. Destructor that deletes the memory used for the transformation array. Definition at line 156 of file utility_classes.cpp. Definition at line 167 of file utility_classes.cpp. Definition at line 195 of file utility_classes.cpp. References mEndHead, mFill, mFillRule, mFontFamily, mFontSize, mFontStyle, mFontWeight, mHeight, mpTransform, mStartHead, mStroke, mStrokeDasharray, mStrokeWidth, mTextAnchor, mVTextAnchor, mWidth, mX, mY, and mZ. Definition at line 110 of file utility_classes.h. Referenced by CLLayoutRenderer::draw_curve(), CLLayoutRenderer::extract_arrowhead_information(), CLLayoutRenderer::map_arrow_head(), and operator=(). Definition at line 101 of file utility_classes.h. Referenced by CLLayoutRenderer::draw_datapoints(), CLLayoutRenderer::extract_2d_attributes(), and operator=(). Definition at line 102 of file utility_classes.h. Definition at line 103 of file utility_classes.h. Referenced by CLLayoutRenderer::extract_text_attributes(), and operator=(). Definition at line 104 of file utility_classes.h. Definition at line 106 of file utility_classes.h. Definition at line 105 of file utility_classes.h. Definition at line 115 of file utility_classes.h. Referenced by CLLayoutRenderer::draw_group(), CLLayoutRenderer::draw_layout(), CLLayoutRenderer::map_arrow_head(), and operator=(). Definition at line 100 of file utility_classes.h. 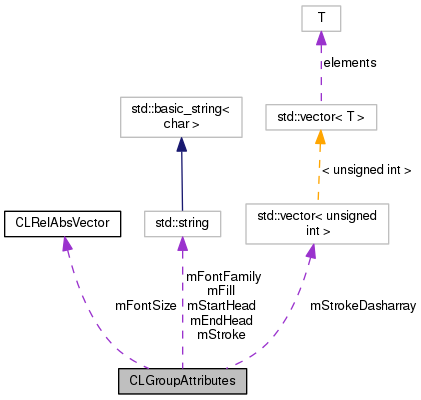 Referenced by CLGroupAttributes(), CLLayoutRenderer::draw_curve(), CLLayoutRenderer::draw_datapoints(), CLLayoutRenderer::draw_group(), CLLayoutRenderer::draw_image(), CLLayoutRenderer::draw_text(), CLLayoutRenderer::extract_transformation_attributes(), CLLayoutRenderer::map_arrow_head(), operator=(), and ~CLGroupAttributes(). Definition at line 109 of file utility_classes.h. Definition at line 96 of file utility_classes.h. Referenced by CLLayoutRenderer::draw_curve(), CLLayoutRenderer::draw_datapoints(), CLLayoutRenderer::draw_layout(), CLLayoutRenderer::draw_text(), CLLayoutRenderer::extract_1d_attributes(), and operator=(). Definition at line 98 of file utility_classes.h. Referenced by CLLayoutRenderer::draw_line(), CLLayoutRenderer::extract_1d_attributes(), and operator=(). Definition at line 97 of file utility_classes.h. Referenced by CLLayoutRenderer::draw_curve(), CLLayoutRenderer::draw_datapoints(), CLLayoutRenderer::draw_layout(), CLLayoutRenderer::draw_line(), CLLayoutRenderer::extract_1d_attributes(), and operator=(). Definition at line 107 of file utility_classes.h. Referenced by CLLayoutRenderer::draw_text(), CLLayoutRenderer::extract_text_attributes(), and operator=(). Definition at line 108 of file utility_classes.h. Definition at line 114 of file utility_classes.h. Definition at line 111 of file utility_classes.h. Referenced by CLLayoutRenderer::draw_curve(), CLLayoutRenderer::draw_datapoints(), CLLayoutRenderer::draw_group(), CLLayoutRenderer::draw_image(), CLLayoutRenderer::draw_layout(), CLLayoutRenderer::draw_text(), CLLayoutRenderer::map_arrow_head(), and operator=(). Definition at line 112 of file utility_classes.h. Definition at line 113 of file utility_classes.h.